Thin Space Saver Jugs are great for storing 2 part solutions in tight spaces. Each jug can hold just shy of 1 gallon, and takes up only 2 ½ inches in width. These jugs take up much less space than the standard Mr. Chili mixing jugs. Well, it's a slim jug. Works great as a slim jug. Only issue I have with it is that it has 1L markings on it for 1, 2, 3 and 4 Liters. 1L marking is on point but after that they take a huge dive off the accuracy cliff. At 1g the jug is only 3/4 full. It holds almost 5.5L. Kinda annoying, but I suppose all that extra space is somewhat useful, can mix a new gallon and add it when the current one is only half gone. Like the profile of this container. Is the same height as my sump and saves a lot of space. Only wish it came in clear container. I am dosing Kalk and can't see where my suction tube ends up at the bottom. Needed a slim container for my nano tank ATO. Works perfectly. I use them for my alk and ca and other Supplemts, with the bulkheads there the best slim don’t take much room and after a year nothing wrong with them. Bought two of these containers for 2-part dosing. They fit ideally in front of my sump. Thought I was going to have to build a custom container at significantly more cost. Looked and looked for a slim container to drain my skimmer with no luck. Then I came across this--perfect fit next to my sump! What can I say? Container is slim and holds whatever you want to store in it. Price could be cheaper but can't really find anything that's like it. Purchased for my Kelkwasser. Perfect size for my daily dose and cabinate. I'll be purchasing more for other applications. I save $$ using BRS bulk 3 part. Now I save a lot of space as 3 of these fit into my usable space very nicely. Less wasted space and out of my way. How many ML of liquid can be stored in this container ? The 4 lter mark is not at the top level. 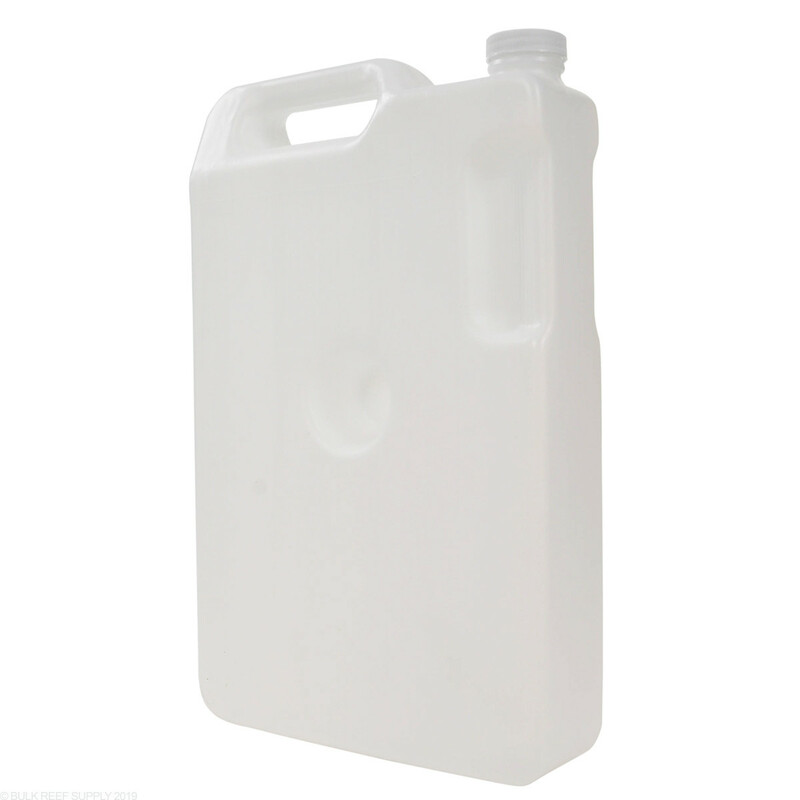 The max I would place in the container is 4L (which is 4000mL). The container can be orientated in multiple directions so if you fill it up higher then that it may spill if you change the orientation of the container. Will the 100mm funnel fit in the opening of the space saver jugs? It sure will. The space saving jug actually has the same size opening as our regular jugs. Will the 1/4" Push Connect Bulkhead Tank Adapter fit in the opening of the container? Without needing additional drilling? Unfortunately we are currently unable to stock the 2 gallon size however We can bring this up to our potential new items list for review! Does the container need a small vent hole so that the walls won't collapse on itself as the liquid gets sucked out (creating a vacuum)? It depends on how tight the seal of the line is! If the seal is air tight you will need a vent hole. Feel free to let us know if you have any further questions! Will the pump from the AutoAqua Micro fit through the opening of the space saver jugs? Unfortunately the pump is 1/2" too large to fit in the lid. Feel free to let us know if you have any further questions! I was thinking about picking this up to use as my ATO (osmulator) reservoir. Any probelms I'm not thinking of? The pump of the osmolator will not fit in the lid of the container unfortunately. Feel free to let us know if you have any further questions. Do these jugs have a opening in the cap or a stem that goes to the bottom of the jug? If not, do you carry a stem and barb fitting to apply to this? 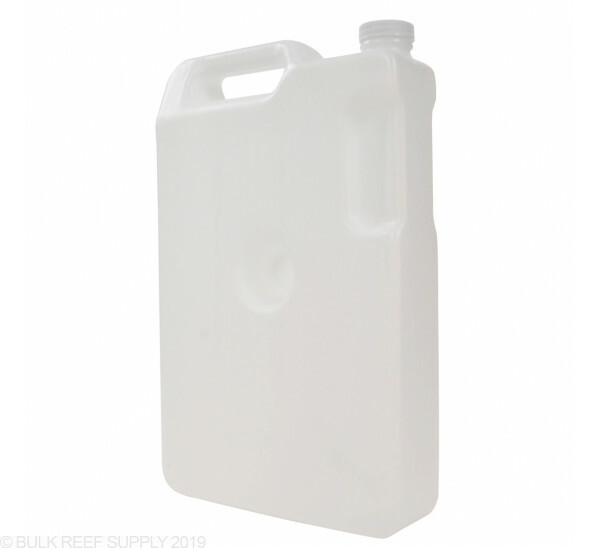 These jugs do not have an opening in the cap, however our 1 oz Dispensing Pump will fit this jug. Can the opening of this jug fit the pump for the Smart ATO Micro water pump? Unfortunately the lid is too small to allow the micro pump to fit. Does this jug include a cap? These jugs will include the cap.